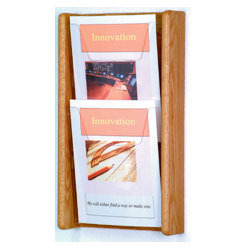 This wood pamphlet rack is designed to be mounted to walls to preserve counter and floor space for other things. 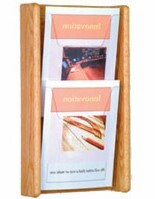 The magazine display is great for placing reading material for those who might be stuck in a waiting room. 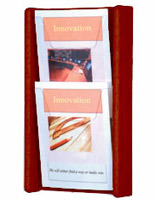 The pamphlet rack with medium oak finish also works well mounted in public buildings to present brochures with important information. 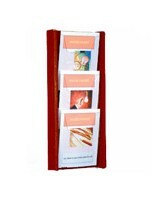 Pockets on the chart holder measure 9.5” wide so trifold leaflets can be placed on display in the slot side-by-side. The rack has a wood back and sides with a full panel of acrylic on each compartment for easy patient viewing and to help keep magazines from bowing over and getting bent. 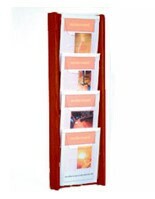 The chart holder comes with all the necessary hardware for mounting included with purchase for less hassle. 11.0" x 19.0" x 3.0"